These lovely cheeses have not been aged or ripened and retain much of the flavor of fresh milk. Firm, smooth A Middle Eastern-style cheese with complex flavor. Primarily used as a table cheese. Also spelled Akawi and Akawieh. May also be a semi-hard cheese. Soft curds Similar to cottage cheese but smoother and softer. Mainly used in baked goods. Soft, creamy, smooth A Middle Eastern cheese eaten as is with crackers, in sandwiches, or as an appetizer. 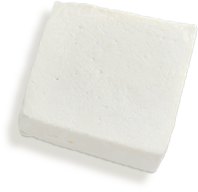 Semisoft, moist A semisoft loose curd cheese similar to Panela in taste and usage. Mainly used in cooking. Soft and moist with large or small curds Eaten alone or in salads. May be flavored, as with chives. Also good in cooked foods or blended for dips. Low-fat and nonfat types available. Soft, smooth Soft, spreadable cheese often used on sandwiches, also in cooked foods. Soft, creamy Variation of an Italian-style cheese. Good on flat bread or pizza. Excellent dessert cheese paired with fresh fruit such as berries, peaches and plums. Semisoft, creamy, moist Curds are the solids formed in curdled milk from which cheese is made. Some cheesemakers sell fresh curds that can be enjoyed plain or, more commonly, used in cooked foods. Soft, creamy A mild, moist, smooth-textured cheese made from uncooked and unripened curd. Used as an ingredient in baking, in cooking and for eating, as with fruit. Soft, creamy Italian-style cheese similar to ricotta, but creamier. Commonly used as an ingredient in desserts or with fruit. Firm, moist Hispanic-style cheese with a flavor similar to cottage cheese. Softens but does not melt when heated. Use in sandwiches, salads, with fruit and in cooked foods. Smooth, spreadable A soft cheese similar to cottage cheese. Used in baking, also in dips and with fruit. Soft, moist, crumbly Most commonly used Hispanic-style cheese with a texture that softens but does not melt when heated. Use as a topping or filling in cooked dishes. Also good with fruit. When sold in large blocks, it can be called Adobera. Soft, moist, grainy An Hispanic version of ricotta that is used in salads, dips, cooked foods and desserts. Soft, moist, grainy Similar to cottage cheese, but slightly sweeter with a smoother texture. This Italian-style cheese is good in salads, dips, cooked foods and desserts. A Middle Eastern-style cheese with complex flavor. Primarily used as a table cheese. Also spelled Akawi and Akawieh. May also be a semi-hard cheese. Similar to cottage cheese but smoother and softer. Mainly used in baked goods. A Middle Eastern cheese eaten as is with crackers, in sandwiches, or as an appetizer. A semisoft loose curd cheese similar to Panela in taste and usage. Mainly used in cooking. Eaten alone or in salads. May be flavored, as with chives. Also good in cooked foods or blended for dips. Low-fat and nonfat types available. Soft, spreadable cheese often used on sandwiches, also in cooked foods. Variation of an Italian-style cheese. Good on flat bread or pizza. Excellent dessert cheese paired with fresh fruit such as berries, peaches and plums. Curds are the solids formed in curdled milk from which cheese is made. Some cheesemakers sell fresh curds that can be enjoyed plain or, more commonly, used in cooked foods. A mild, moist, smooth-textured cheese made from uncooked and unripened curd. Used as an ingredient in baking, in cooking and for eating, as with fruit. Italian-style cheese similar to ricotta, but creamier. Commonly used as an ingredient in desserts or with fruit. Hispanic-style cheese with a flavor similar to cottage cheese. Softens but does not melt when heated. Use in sandwiches, salads, with fruit and in cooked foods. A soft cheese similar to cottage cheese. Used in baking, also in dips and with fruit. Most commonly used Hispanic-style cheese with a texture that softens but does not melt when heated. Use as a topping or filling in cooked dishes. Also good with fruit. When sold in large blocks, it can be called Adobera. An Hispanic version of ricotta that is used in salads, dips, cooked foods and desserts. Similar to cottage cheese, but slightly sweeter with a smoother texture. This Italian-style cheese is good in salads, dips, cooked foods and desserts. Delicate and delicious, these cheeses are typically mild when young and develop a fuller flavor with age, often becoming softer and creamier in the process. White crust with soft, creamy yellow interior Refers to a type of soft-ripened cheese with pronounced flavor sometimes served at breakfast with bread and fruit. Also delicious as a snack or for entertaining. White crust with soft, creamy white interior Soft-ripened cheese with edible white crust. Flavor becomes stronger as cheese ages and creamy interior becomes softer. Delicious with crackers or bread, or with fruit for dessert. White crust with soft, creamy white interior Similar to Brie but with a richer taste and mouthfeel because of higher fat content. Soft crust with soft, creamy white interior Uses are same as for Brie. Semisoft A Middle Eastern-style cheese similar to Halloumi. Eaten as is and on sandwiches and used for frying. Semi-firm, creamy A German-style washed-rind cheese that has mildly strong flavor when young, becoming more pungent and rich with age. Usually eaten plain with crackers or bread. Soft, cream A very soft cheese at room temperature. Large pieces may have rice flour crust. Excellent as a snack, with crackers or bread, in salads or with fruit. Teleme is a California original. Refers to a type of soft-ripened cheese with pronounced flavor sometimes served at breakfast with bread and fruit. Also delicious as a snack or for entertaining. Soft-ripened cheese with edible white crust. Flavor becomes stronger as cheese ages and creamy interior becomes softer. Delicious with crackers or bread, or with fruit for dessert. 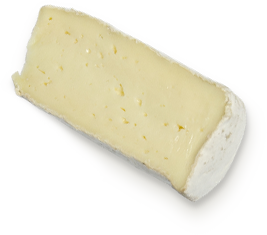 Similar to Brie but with a richer taste and mouthfeel because of higher fat content. Uses are same as for Brie. A Middle Eastern-style cheese similar to Halloumi. Eaten as is and on sandwiches and used for frying. A German-style washed-rind cheese that has mildly strong flavor when young, becoming more pungent and rich with age. Usually eaten plain with crackers or bread. A very soft cheese at room temperature. Large pieces may have rice flour crust. Excellent as a snack, with crackers or bread, in salads or with fruit. Teleme is a California original. The broadest range of varieties and styles, these cheeses include many of what we commonly refer to as “table cheeses.” They can be anywhere from soft and creamy, having been aged only a few weeks, to moderately firm, aged a month or more. Semi-firm Middle Eastern-style cheese, good as is and with fruit (see also Ackawi under Fresh Cheeses). Firm to very firm Italian-style cheese with sharp, rich flavor. Used for eating and cooking. Harder, more-aged versions used for grating in ways similar to Dry Jack or Parmesan. Semi-firm Similar to Swiss cheese but with smaller holes. Use as is, for snacks and sandwiches and in cooked dishes. Comes in low-fat variety. 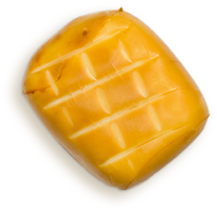 Firm A firm, flavorful, smooth-textured table cheese that also melts well. Typically aged four to six months. Firm Cheddar describes a family of cheeses — very popular and versatile cheeses available in a range of flavors from mild to very sharp. Good as is and in sandwiches. Melts well and is very good in cooked foods or shredded and sprinkled on top. Firm Unpasteurized (raw) milk plus aging gives cheddar a delicious sharpness. Eaten as is and with crackers, bread, or fruit. Semi-firm to firm Hispanic-style cheese similar to Cotija. It is used the same way as Cotija in cooked foods. Semi-firm Like Cheddar, but somewhat milder and softer. It is used as is for snacks and in cooked foods. Firm A blend of Colby and Jack used for eating, especially snacks and sandwiches. Also called CoJack and Calico. Semi-firm to firm, crumbly Hispanic-style cheese similar to feta. Crumble and sprinkle over cooked dishes, soups, beans and salads. Also called Queso Anejo (aged cheese). Some types may be very dry and hard (see Very Hard Cheeses section). Firm Similar to Gouda, Edam is very tasty as is, with crackers or other snacks. Firm, dry, crumbly Slightly aged Hispanic-style cheese with mild red chili or paprika coating. When aged longer (Anejo-style), it may be quite hard. Heated, it softens but does not melt. Crumble onto Mexican foods, soups and salads. Dry, firm to hard, crumbly Greek and Bulgarian-style cheese used in many Middle Eastern dishes. Good in many cooked dishes, including pasta, or topping for soups and salads. Comes in fat-free variety. Firm A Middle Eastern-style cheese typically cut into slices and fried. Holds shape when hot. Top with sauces or salsa. Used for saganaki. Firm A popular mild cheese, eaten as is for snacks, also in cooked foods, salads and sandwiches. Similar to Edam. Firm A Dutch-style cheese also called Boere Kaas. Has a sharper, more complex flavor than most Goudas due to the use of raw milk and aging. Used for eating and cooking. Semi-firm Mild cheese similar to Edam and Gouda. Used both for snacks and in cooked foods and salads. Firm A form of Cheddar. Used as is and in cooked foods. Semi-firm to firm This California interpretation of a traditional Spanish cheese uses cows' milk to create a tasty table cheese. Eaten as is or in sandwiches. Melts well when used for cooking. Firm Distinctive-looking blend of orange and white Cheddars, typically mild to medium sharpness. Uses are the same as for Cheddar. Smooth, semi-firm Hispanic-style cheese similar in taste and uses to Gruyere or Gouda. Semi-firm to firm (also a high-moisture form with buttery texture) A very popular, versatile cheese that was created in California. Popular as a snack, also good in sandwiches, salads and cooked foods. Also available in an organic version. Semi-firm Commonly used in cooking, especially pizza, because of its excellent melting properties. While technically a fresh cheese, this Mozzarella is commonly grouped with semi-hard cheeses because of its firm texture. Semi-firm Hispanic-style cheese similar to Mozzarella but with a distinctive braided appearance. Use as is, in sandwiches or melted on cooked foods, including pizza and nachos. Firm A French-style cheese similar to Gouda or Edam in taste and appearance. Eaten as is, but also good for cooking. Semi-firm to firm Italian-style cheese eaten as is or on sandwiches, also used in cooked foods. Semi-firm to firm, creamy Hispanic-style cheese similar to mild cheddar to tangy Jack. Used in cooked foods and fondues. Semi-firm Mild, Italian-style cheese similar to Mozzarella (low moisture, part skim). Traditionally tied with string at top, which gives it a distinctive pear shape. 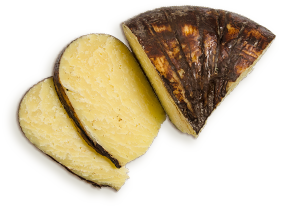 Firm Portuguese-style table cheese with a rich, medium, sharp flavor. Semi-firm, chewy A popular snack, especially with children who enjoy the chewy, stringy texture. Also used in cooked foods. Firm A Syrian-style string cheese, similar to regular string cheese. Also for snacks and in cooked foods. Middle Eastern-style cheese, good as is and with fruit (see also Ackawi under Fresh Cheeses). Italian-style cheese with sharp, rich flavor. Used for eating and cooking. Harder, more-aged versions used for grating in ways similar to Dry Jack or Parmesan. Similar to Swiss cheese but with smaller holes. Use as is, for snacks and sandwiches and in cooked dishes. Comes in low-fat variety. A firm, flavorful, smooth-textured table cheese that also melts well. Typically aged four to six months. Cheddar describes a family of cheeses — very popular and versatile cheeses available in a range of flavors from mild to very sharp. Good as is and in sandwiches. Melts well and is very good in cooked foods or shredded and sprinkled on top. Unpasteurized (raw) milk plus aging gives cheddar a delicious sharpness. Eaten as is and with crackers, bread, or fruit. Hispanic-style cheese similar to Cotija. It is used the same way as Cotija in cooked foods. Like Cheddar, but somewhat milder and softer. It is used as is for snacks and in cooked foods. A blend of Colby and Jack used for eating, especially snacks and sandwiches. Also called CoJack and Calico. Hispanic-style cheese similar to feta. Crumble and sprinkle over cooked dishes, soups, beans and salads. Also called Queso Anejo (aged cheese). Some types may be very dry and hard (see Very Hard Cheeses section). Similar to Gouda, Edam is very tasty as is, with crackers or other snacks. Slightly aged Hispanic-style cheese with mild red chili or paprika coating. When aged longer (Anejo-style), it may be quite hard. Heated, it softens but does not melt. Crumble onto Mexican foods, soups and salads. Greek and Bulgarian-style cheese used in many Middle Eastern dishes. Good in many cooked dishes, including pasta, or topping for soups and salads. Comes in fat-free variety. A Middle Eastern-style cheese typically cut into slices and fried. Holds shape when hot. Top with sauces or salsa. Used for saganaki. A popular mild cheese, eaten as is for snacks, also in cooked foods, salads and sandwiches. Similar to Edam. A Dutch-style cheese also called Boere Kaas. Has a sharper, more complex flavor than most Goudas due to the use of raw milk and aging. Used for eating and cooking. Mild cheese similar to Edam and Gouda. Used both for snacks and in cooked foods and salads. A form of Cheddar. Used as is and in cooked foods. This California interpretation of a traditional Spanish cheese uses cows' milk to create a tasty table cheese. Eaten as is or in sandwiches. Melts well when used for cooking. Distinctive-looking blend of orange and white Cheddars, typically mild to medium sharpness. Uses are the same as for Cheddar. Hispanic-style cheese similar in taste and uses to Gruyere or Gouda. A very popular, versatile cheese that was created in California. Popular as a snack, also good in sandwiches, salads and cooked foods. Also available in an organic version. Commonly used in cooking, especially pizza, because of its excellent melting properties. While technically a fresh cheese, this Mozzarella is commonly grouped with semi-hard cheeses because of its firm texture. Hispanic-style cheese similar to Mozzarella but with a distinctive braided appearance. Use as is, in sandwiches or melted on cooked foods, including pizza and nachos. A French-style cheese similar to Gouda or Edam in taste and appearance. Eaten as is, but also good for cooking. Italian-style cheese eaten as is or on sandwiches, also used in cooked foods. Hispanic-style cheese similar to mild cheddar to tangy Jack. Used in cooked foods and fondues. Mild, Italian-style cheese similar to Mozzarella (low moisture, part skim). Traditionally tied with string at top, which gives it a distinctive pear shape. Portuguese-style table cheese with a rich, medium, sharp flavor. A popular snack, especially with children who enjoy the chewy, stringy texture. Also used in cooked foods. A Syrian-style string cheese, similar to regular string cheese. Also for snacks and in cooked foods. Beauty often comes with age and aged cheeses are no exception. These are the cheeses that are hard enough to grate or crumble. Hard to very hard, depending on age Italian-style cheese similar to Parmesan, typically grated over cooked foods or salads. Hard, dry, crumbly Hispanic-style cheese typically shredded onto cooked foods, also in salads and with fruit. Hard to very hard, depending on age Eaten as is, or in cooked foods or grated onto pasta or salads. May be aged from seven months to several years. Hard, dry, crumbly Aged version (Anejo) of Enchilado. Good as a topping crumbled onto cooked foods. Softens but does not melt under heat. Hard to very hard, depending on age Italian-style cheese similar to Parmesan but more piquant and salty. Use is the same as for Dry Jack and Parmesan. Italian-style cheese similar to Parmesan, typically grated over cooked foods or salads. Hispanic-style cheese typically shredded onto cooked foods, also in salads and with fruit. Eaten as is, or in cooked foods or grated onto pasta or salads. May be aged from seven months to several years. Aged version (Anejo) of Enchilado. Good as a topping crumbled onto cooked foods. Softens but does not melt under heat. Italian-style cheese similar to Parmesan but more piquant and salty. Use is the same as for Dry Jack and Parmesan. A broad family of cheeses that reflect the cheesemaking styles and traditions brought to California from Mexico, Central and South America and Spain. Firm Hispanic-style cheese similar to Provolone in its slightly tangy taste and firm texture. Made with whole or low-fat milk, it melts well and is used in such dishes as quesadillas and nachos as well as hamburgers and sandwiches. Semi-firm to firm, crumbly Hispanic-style cheese similar to feta. Crumble and sprinkle over cooked dishes, soups, beans and salads. Also called Queso Anejo (aged cheese). Some types may be very dry and hard. Hard, dry, crumbly Aged version (Anejo) of Enchilado. Good as topping crumbled onto cooked foods. Softens but does not melt under heat. Semi-firm to firm This California interpretation of a tradition Spanish cheese uses cow’s milk to create a tasty table cheese. Eaten as is or in sandwiches. Melts well when used for cooking. Smooth, semi-firm Hispanic-style cheese similar in taste and uses to Gruyère or Gouda. Semi-firm Hispanic-style cheese similar to Mozzarella but with a distinctive braided appearance. Use as is, in sandwiches, or melted on cooked foods, including pizza and nachos. Firm, moist Hispanic-style cheese with flavor similar to a dry pressed ricotta. Softens but does not melt when heated. Use in sandwiches, salads, with fruit and in cooked foods. 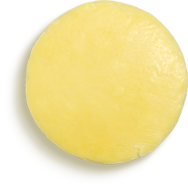 Soft, moist, firm Most commonly used Hispanic-style cheese with a texture that softens but does not melt when heated. Use as a topping or filling in cooked dishes. Also a great crumble onto fruit, beans, salads and other dishes. Commonly referred to as Queso Para Frier when sold as a frying cheese. Soft, moist, grainy Hispanic version of ricotta that is used in salads, dips, cooked foods and desserts. Hispanic-style cheese similar to Provolone in its slightly tangy taste and firm texture. Made with whole or low-fat milk, it melts well and is used in such dishes as quesadillas and nachos as well as hamburgers and sandwiches. Hispanic-style cheese similar to feta. Crumble and sprinkle over cooked dishes, soups, beans and salads. Also called Queso Anejo (aged cheese). Some types may be very dry and hard. Aged version (Anejo) of Enchilado. Good as topping crumbled onto cooked foods. Softens but does not melt under heat. This California interpretation of a tradition Spanish cheese uses cow’s milk to create a tasty table cheese. Eaten as is or in sandwiches. Melts well when used for cooking. Hispanic-style cheese similar in taste and uses to Gruyère or Gouda. Hispanic-style cheese similar to Mozzarella but with a distinctive braided appearance. Use as is, in sandwiches, or melted on cooked foods, including pizza and nachos. Hispanic-style cheese with flavor similar to a dry pressed ricotta. Softens but does not melt when heated. Use in sandwiches, salads, with fruit and in cooked foods. Most commonly used Hispanic-style cheese with a texture that softens but does not melt when heated. Use as a topping or filling in cooked dishes. Also a great crumble onto fruit, beans, salads and other dishes. Commonly referred to as Queso Para Frier when sold as a frying cheese. Hispanic version of ricotta that is used in salads, dips, cooked foods and desserts.